Hello friends! Nichol here today with a bee hive scene card featuring the new Bee Hive Honey Cuts, Branch and Leaves Honey Cuts, and Busy Bees Stamps. The Outdoor Scene Builder Stencil (clouds), Bee-You-Tiful Sentiments Honey Cuts, and Bee-You-Tiful Sentiments Stamps round out this fun design! The background sky was created with the Outdoor Scene Builder Stencil clouds and Salty Ocean Distress Ink on Bristol Smooth Cardstock. The branch from the Branch and Leaves Honey Cuts was die cut from brown cardstock and inked with Ground Espresso Distress Ink and the leaves were die cut from two shades of green cardstock and inked with Mowed Lawn Distress Ink. The branch and leaves were adhered over the cloud background as shown. The Bee Hive Honey Cuts was die cut from three shades of yellow cardstock, inked with a combination of Wild Honey and Ground Espresso Distress Inks and adhered to appear to be hanging from the branch. I just love all the layers here! Isn’t it cute?!!!! Sentiments from the Bee-You-Tiful Sentiments Stamps were stamped in the lower right corner of the design using black ink. 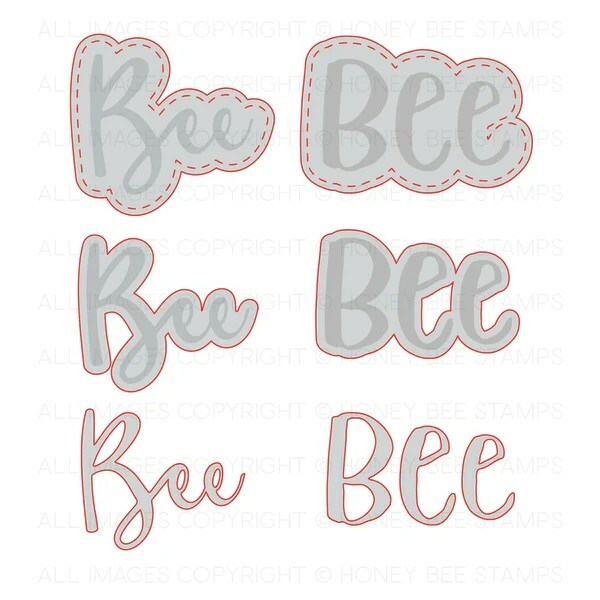 The word “Bee” from the Bee-You-Tiful Sentiments Honey Cuts was die cut from smooth white cardstock adhered to Fun Foam with Stick It Adhesive, inked with Wild Honey Distress Ink and adhered to round of the greeting. Bees and hearts from the Busy Bees Stamps Set were stamped on smooth white cardstock with black ink, colored in with Copic Markers, and die cut with the coordinating dies. The images were adhered to the card with a combination of foam adhesive squares and glue dots. Nuvo Crystal Drops in White Blizzard were used to add shimmer and sparkle to the bee wings, Ebony Nuvo Crystal Drops were used to add definition to the bee’s eyes, and Dandelion Yellow and Simply White Nuvo Crystal Drops were scattered throughout for a fun touch. A white opaque pen was used to add highlights and detail to the die cut and stamped images. Below you will find links to the supplies used to create this project(s). Click the icon for the store underneath the thumbnails to start shopping.